The thought of spending your summer vacation studying and learning is something almost any college student would pass on. Yet for a select group of 80 university students, this is exactly their itinerary. These students are participating in IsraeLinks, a three-week in-depth learning experience of Israel’s most important and holiest sites. IsraeLinks consists of two trips, the first of which is presently underway. 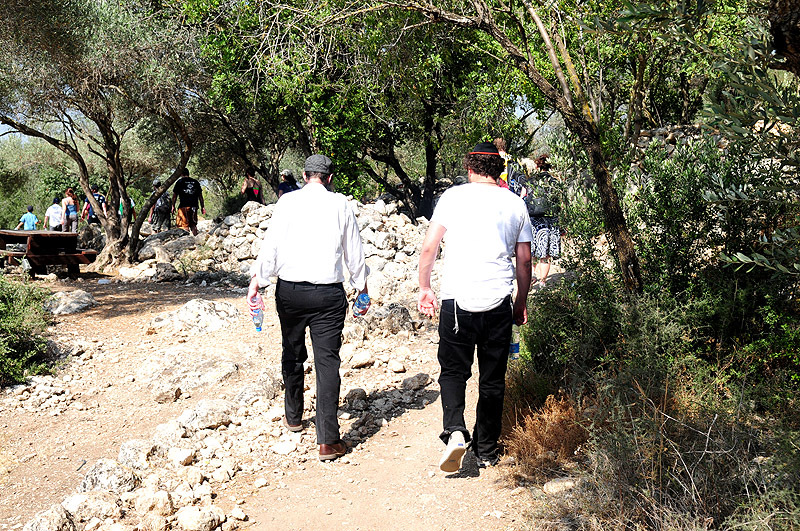 Organized and funded by the Chabad on Campus International Foundation, the tour has given insight and inspiration to hundreds of past participants. “The trip is designed to connect the students to the past, present and future of the Jewish people and bring it to life through a comprehensive learning and touring experience of Israel,” said Rabbi Yossy Gordon, Executive Vice President of Chabad on Campus. “After only 2 1/2 weeks of what I thought would just be a series of lectures and excursions, I can honestly say that I’m getting on the plane home with an entirely new perspective,” said Alissa Bittenson from University of Southern California. Building on previous years’ successes, Rabbi Yossi and Chaya Witkes, co-directors of IsraeLinks, moved to Jerusalem this past year. Being on the ground in Israel will allow for smoother planning and implementation of the program and further expansion in the near future. “Since the program’s inception five years ago, IsraeLinks has made a difference in hundreds of lives. Many IsraeLinks alumni are now living or learning in Israel with many more alumni going on to leadership positions in their respective Jewish community back at their universities and beyond,” said Rabbi Witkes. Thanks to 5771 being a leap year on the Jewish calendar, the students got to participate in Lag B’omer festivities in Meron and celebrations of the 1967 reunification of Jerusalem, both once in a lifetime opportunities for them. This was a special bonus in addition to the other exciting activities and sites on tap. With top educators staffing IsraeLinks, including world-renowned teacher Rabbi Yosef Yitzchok Jacobson, Dean of TheYeshiva.Net and the multi-talented Rabbi Asi Spiegel, the program is sure to educate and inspire. Rabbi Zalman and Yehudis Bluming, co-directors of Chabad serving UNC and Duke are leading the first trip and Rabbi Zalman and Sarah Deitsch, co-directors of Chabad serving OSU are slated to lead the second. The students will also benefit from the highly knowledgeable tour guides of Israel Maven, special guest speakers and the famous staff at the Ascent institute of Tzfat. Want to keep up to date with IsraeLinks travels? “Like” Chabad on Campus on Facebook for real time updates by visiting www.facebook.com/chabadoncampus.